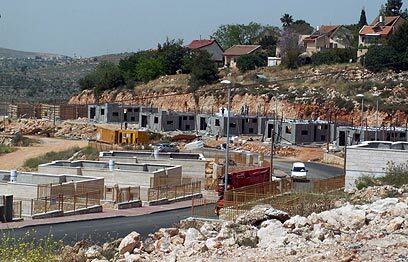 The Defense Ministry has approved two plans for the construction of 119 housing units in the West Bank settlement of Shilo, Ynet has learned. The building permits were revealed in the State's response to a petition filed with the High court of Justice by Peace Now eight months ago after the construction of 40 units had already begun on a number of Shilo plots. A hearing on the matter is scheduled for Monday. Defense Minister Ehud Barak's bureau said in response: "Anything approved in Shilo is just approval of the existing situation; any additional construction will need a new permit." In its petition, Peace Now claimed the construction was illegal and was not included in the original plan for the area, as approved by the Central Bureau of Planning at the Civilian Administration of Judea and Samaria. In its response, submitted Wednesday, the State said that in light of the petition it has decided to retroactively authorize all permanent housing units included in the two construction plans. Hagit Ofran, director of Peace Now's Settlement Watch project, said "for every home the government does not destroy in the illegal outposts, it approves dozens of other homes in other settlements. I don’t expect the court to stop settlement construction, but I do expect that the law will not be ruled by the settlers. "At least now everyone knows the government's policy is to authorize hundreds of housing units, even if this is done by retroactively approving illegal construction," she added. See all talkbacks "Defense ministry approves more settlement construction "